Flight time 20hrs from London. 11hrs 35mins from NYC. Imagine exploring a part of the world that’s so untouched that few have trodden the same path before. Imagine exploring it in a way that’s totally unique without a single person having experienced it in the same way as you. Sound impossible? Think again. From the bright lights of La Paz, we’re taking you deep into the lunar landscapes of the Salar de Uyuni, with plenty of adventure along the way. 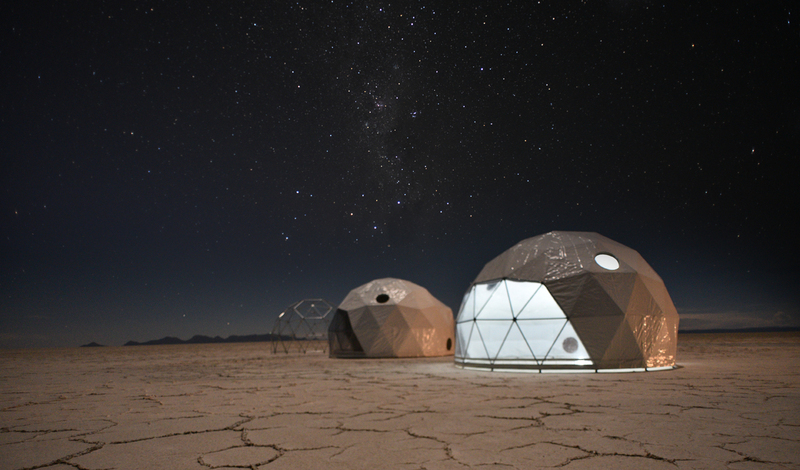 Out in this endless expanse of showstopping landscapes, you’ll spend three days waking up to watch the sunrise over the Salar de Uyuni from a luxurious, innovative dome camp, in complete solitude – a story that so few will be able to tell. The perfect springboard onto South America, make this experience all the more unforgettable by tagging on some time in Peru, Chile, Argentina or beyond. But first things first; Bolivia. Sitting at 3,640meters, La Paz is the world’s highest capital city so steady yourself here for a few days and take in the city heights and sights while you’re at it. Based at the city’s hippest address, Atix Hotel, you’ll have a city full of trendy bars, gourmet restaurants and contemporary art at your fingertips. Latin America’s latest culinary hotbed, get your taste buds going with a tasting menu lunch that afternoon at Ali Pacha, specialists in unique vegetarian fare before heading out on a private walking tour of the colonial center, including the presidential palace, the folklore museum and impressive San Francisco cathedral, and the local markets. In the evening, head to renowned Bolivian artist Gaston Ugalde’s gallery to enjoy the art over a private cocktail front desk before returning to your hotel for the night. The next morning, you’ll join an expert guide out at the archaeological site of Tihuanaco, the origin of much of the Inca architecture, before heading up to the sky-high city of El Alto. Here, you’ll enjoy lunch at the Manq’a Academy (home to budding young chefs) before meeting a traditional healer to have your coca leaves read. The afternoon then takes a stylish turn as you meet up with architect Freddie Mamani, designer of the opulent “Cholet” constructions, and meet some local weavers who will double your luggage with their impressive tapestries and blankets. For dinner that evening, pull up a seat at the Chef’s Table of Claus Meyer’s Gustu and savor the innovative creations Manq’a students aspire to. 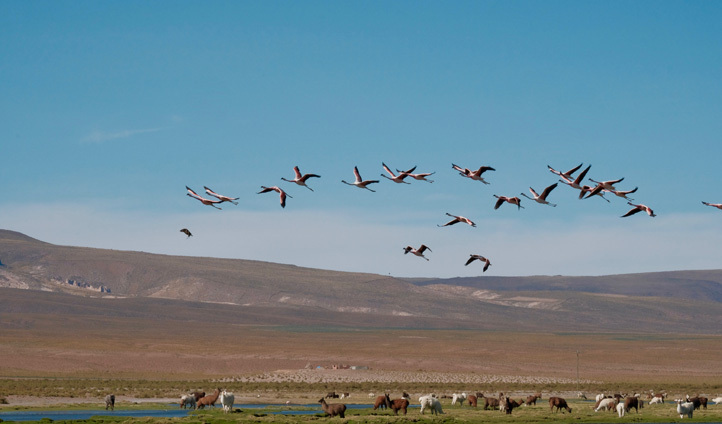 From La Paz, it’s then just an early – but quick – one-hour flight down to Uyuni, from where you need only jump in a jeep to experience wild and untamed landscapes. Cruise across the lunar-like salt flats marvelling at the splendid isolation of it all with seemingly nothing on the horizon for miles around. Until you come to Kachi Lodge. In keeping with the otherworldly landscapes of the Salar, this luxurious lodge will appear as if from another world – until you step inside to discover all of today’s modern day luxuries. Sumptuous beds facing out at transparent panels, you’ll have to pinch yourself waking up to these views. A breathtaking environment at your fingertips, spend two days exploring the Salar, marvelling at the scenery and, of course, playing with perspective on that perfect white canvas. For the adventure seekers, trekking, biking and Tunupa Volcano await – whilst for those looking for a cultural hit? Your guide will take you into the village of Coquesa, a community that is home to both ancient mummies and modern mining; it provides fascinating insight into the daily life in this most unforgiving environment. Dotted along the way with perfect picnics, awe-inspiring sundowners and private astrology sessions unlike anything your eyes can imagine, your days in the Salar make for an unforgettable experience. One last meal out beneath the stars and, just like that, your adventure has come to an end. To end on a high we can arrange for you to be picked up by a private light aircraft right outside your camp, to then soar over Andean peaks and volcanoes before landing in La Paz and continuing your onward journey – but where to? Home, or beyond? The choice is yours. Fancy discovering more extraordinary landscapes in remote locations? Blink will take you there.